JMT’s FACT OF THE DAY: In ancient folklore, chia essentially means strength – and has primarily been used as a breakthrough energy booster in several cultures to this day. Chia seeds – those little black and white seeds – originate from a flowering plant native to both Mexico and Guatemala, and are a concentrated foodstuff comprising of healthy omega-3 fatty acids, fibre, antioxidants, carbohydrates, calcium and protein. Who knew?! OK, now that we have regaled you with tales of the origin of the chia seeds (that, guaranteed, you can impress you friends with next time you see them), it is now time to reveal to you the important stuff (the reason why you came here, right? ): the amazing benefits of chia seeds. Here, at JMT, we have collated the top 4 health benefits of chia seeds, and why exactly you should be adding them to just about, well, everything! A single serving of chia seeds has been shown to contain up to 18-30% of the daily recommended intake of calcium, manganese, phosphorus, fibre and omega-3 fatty acids. The former, essentially, assists in both bone and oral health, helping to ward off conditions such as osteoporosis, and dental development. Also comprising of phosphorus, chia seeds contain ~27% of your daily needs which also helps to strengthen teeth and bones as well as synthesize protein for tissue growth and repair. For those with Type-2 diabetes, fluctuant, labile blood sugar, or those looking for a healthy alternative to a snack when those afternoon hunger pangs hit, Chia seeds have been studied as a potential natural treatment. The outer coating of seeds when exposed to fluids in the body helps to stabilise and regulate blood glucose spikes, thereby preventing feelings of hunger, fatigue and general malaise. Similarly, it also helps to fight insulin resistance and thereby retention of unwanted (and often detrimental) stomach fat which can be harmful for your overall health and well-being. Tryptophan, found in chia seeds, aids in regulating appetite and improve digestive function. This will not only leave you feeling fuller for longer (and stop you reaching for those after lunch biscuits), but also help to improve mood and sleep function when eaten regularly. Chia seeds are a fantastic source of protein, particularly for those that choose a plant-based and/or vegetarian/vegan lifestyle, where finding such sources may be difficult. Chia seeds are also known not to contain any forms of cholesterol, which, over time in conjunction with a healthy lifestyle and exercise regimen, will help to lower your body’s level of cholesterol (low-density lipoproteins and triglycerides) to that within a healthy range and increase healthy cholesterol (high density lipoproteins). This essentially has the potential to improve heart, vascular and cerebrovascular health in the prevention of strokes, heart attacks and blood clots. A single serving of chia seeds (~28g) comprises of 4.4g of protein – nearly 15% of you recommended daily intake! New to chia seeds? Why not try this recipe? Chia pudding, packed with nutritional benefits, is a perfect breakfast option or dessert when drizzled with honey or other sweet toppings. 2. Next, cover and refrigerate overnight or for up to 8 hours to allow for thickening. 4. Add fruit for a well-rounded and delicious topping! 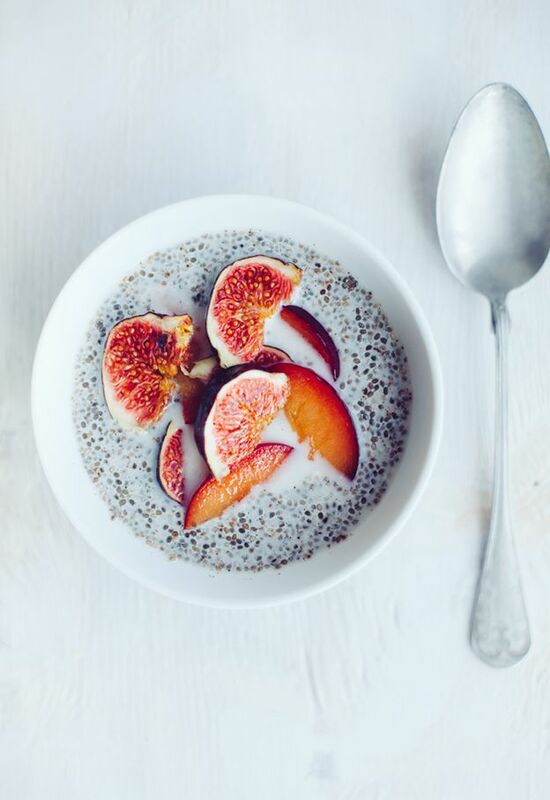 How do you eat your chia seeds? Let us know in the comments below!